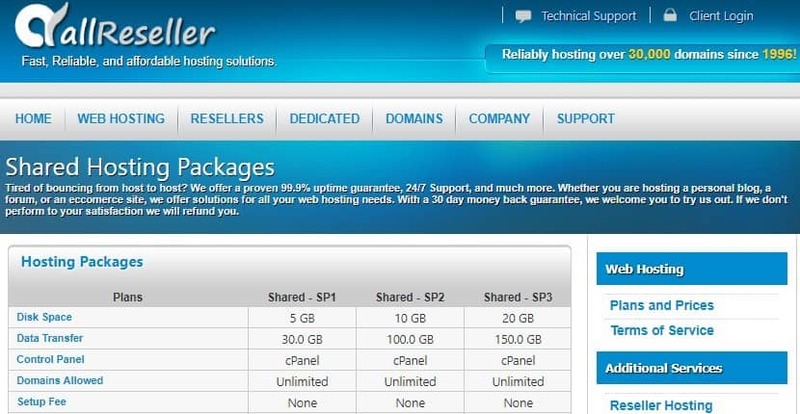 allReseller Review 2019: Is allReseller a Good Hosting? allReseller is a full service web hosting vendor situated in Denver, Colorado in the United States. The company was established in 1996 and has been offering shared web hosting, VPS, dedicated servers, and reseller hosting to individuals, small, and medium sized businesses across the United States. Today, they pride themselves in hosting over 30,000 domains. The starter package for allReseller shared hosting packages includes 5GB disk space, 30GB data transfer, and five MySQL databases, while the premium package comes with 20GB disk space, 150GB data transfer, and 15 MySQL databases. Their dedicated servers packages include the Value Server package, the Power Server package, and a third option for a package that companies can build entirely based on their particular business needs. The Value Server package includes 30GB disk space, 1000GB bandwidth, and 2GB RAM, while the Power Server package includes 80GB disk space, 2000GB bandwidth, and 4GB RAM. allReseller performs nightly data backups for easy retrieval of data in case of a disaster. However, the vendor does not provide any information about the length of time for which they retain backups for restoration. While they include a link to their VPS solutions page, the web page is entirely blank, suggesting that they may have discontinued VPS services or that they have yet to make them available to their customers. allReseller shared hosting plans are just a little over the standard prices for similar solutions from other U.S. vendors. The hosting provider does not indicate the pricing of any of their dedicated hosting plans and requires potential customers to contact them via email for a quote. They allow customers to choose monthly or annual payment plans, and all of their hosting plans include free setup, a 99.9% uptime network guarantee, and a 30-day money-back guarantee. However, their network outages are not compensated. You can get allReseller technical help by sending an email to their support team 24/7 or by opening a ticket. Unfortunately, they don’t have a support telephone number or live chat available on their website, and their support team is quite slow in its responses. Some customers have even reported the vendor closing their tickets before ever responding to their concerns, and the support team is at times reported to be unprofessional. The allReseller website does not have a knowledge base, an FAQ section, or hosting tutorials. allReseller web hosting services cost a little more than the average hosting vendor’s solutions but have quite an array of pretty standard features. While their hosting solutions are suitable for individuals and small and medium-sized businesses, their poor customer service may be a turnoff for would-be customers. Check out allReseller’s web hosting options today! Wondering how allReseller stacks up against other Web Hosting companies? Enter any other Web Hosting company and we will give you a side-by-side comparison.